When you log in with the created token, you will no longer have access to the previously created secret in /secret/secret. Next, create a policy that grants a token read rights to the /secret/secret path and assigns all rights to the associated /secret/secret/ folder. Listing 2 shows a corresponding policy. The policies are formatted in HCL, like the Vault configuration. They describe the respective rights (capabilities) for specified paths. The available rights are create, read, update, delete, list, and deny. For access to specially protected areas, you also have sudo. Use token-create to create a new token, as shown above, and replace default with the newly created ita policy. The response from the server shows you that the token is now assigned both the default and the ita policies. The default policy is automatic and prevents access to all paths that are not explicitly mentioned. Logging in as a GitHub user who is a member of the GitHub company group now works with the personal access token stored on GitHub. In today's dynamic cloud environments, administrators need an overview of logins on different machines. This is particularly difficult if the admin team is subject to regular changes. It would be useful if you no longer had to worry about maintaining SSH public keys or distributing and updating shared passwords for administration. Using the example of an Amazon Elastic Compute Cloud (EC2) instance, I will now configure Vault for SSH login (Figure 3). EC2 generates instances based on a template, the Amazon Machine Image (AMI). If this template already contains Vault's SSH back end , spontaneous use becomes child's play. 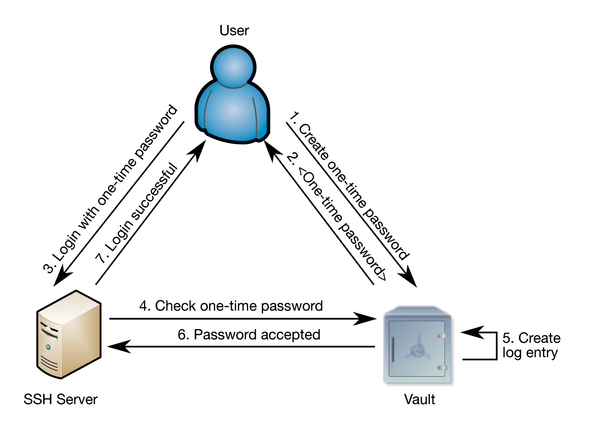 Figure 3: The process of an SSH login with Vault with, in this example, an OTP. Figure 4: SSH logins are handled by the OTP generated here. Now the login should be successful. Next, create a policy for accessing the various SSH logins. You can, of course, use SSH to log in to servers in a cloud environment. In case of staff changes, you can simply revoke the token or update the GitHub team. Auditing in Vault lets you trace user logins with shared SSH user accounts.